Defense Grid: The Awakening Game Review - Download and Play Free Version! Defend Against Invading Alien Forces! The aliens have invaded and it's up to you to defend the precious power cores! With the help of an artificial intelligence construct, you must build towers to kill the aliens before they steal the power cores and cause the Awakening. Defend against the aliens for 20 action-packed story levels, then face dozens of additional challenge levels. Are you ready to do battle? In this tower defense game, build towers along a maze-like path to protect the power cores from waves of enemy aliens. Choose from a variety of towers, such as laser, electricity, guns and more, each with differing attacks, ranges and special moves like slowing enemies. Each tower costs resources, so plan carefully and earn more resources with each alien you kill. The aliens must travel through your maze of towers once, then if they reach the power cores at the end of the maze, they will steal them and try to escape by running between your towers again. Face 15 types of dangerous aliens, including fast aliens, shielded, flying and more, plus many challenging boss aliens. You can upgrade towers to improve damage and range, which is costly but effective, especially since each wave of aliens is more powerful than the previous. This game's amazing graphics, great effects and beautiful soundtrack set this game apart and will transport you to an amazing science fiction world. 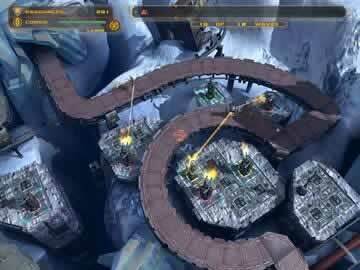 Think strategically to place towers in vital locations and balance building new towers with upgrading old ones. 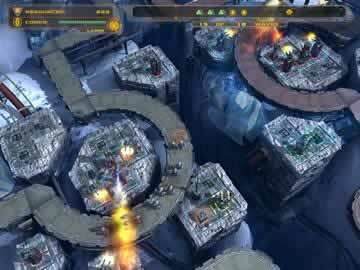 The variety of towers and aliens makes this tower defense game unique, replayable and great for gamers of any skill level. The aliens are here. Can you stop them before it's too late in Defense Grid? 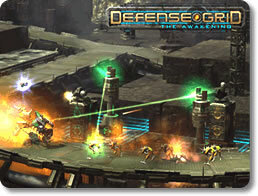 Defense Grid: The Awakening takes tower defense (TD) games to a whole new level. With stellar graphics, an excellent plot line and plenty of levels it will keep you coming back for more. You are the defense grid in charge of defending your power cores against scores of aliens trying to capture and steal them, but first they have to make it past your line of defense. You are an advanced computer in charge of defending the power cores. The power cores are what keep you and your assistant, who is also a computer program, powered up so defending the cores is of the utmost importance. Various paths will lead to the location where your power cores are stored and along those paths there will be locations that turrets can be constructed. Later levels include open grids where your turret placement defines the path that the aliens must follow. There is also a storyline that adds depth to the gameplay. This game is easy to play and includes a tutorial disguised as the first level. The mouse and arrow keys are all you need to play this game. The cursor is fixed in the center of the screen and the camera moves as you move the mouse. Turrets are placed by clicking on an empty turret location. There are 10 different types of turrets to choose from by the end of the game. The turrets include machine guns, lasers, flamethrowers, anti-air missiles, concussion grenades, magnetic fields that slow the enemy, cannons and more. As you progress through the game more turrets are unlocked as well as upgrades for each turret. Each turret can be upgraded twice for a total of three levels. There are 20 main levels to play each with their own unique map and path. Also, after each level is beat there are challenges to complete on the maps. There are many achievements that can be unlocked during game play. These are earned by doing things like holding down the fast forward key or upgrading a turret for the first time. Achievements don't give you any advantage, but it is entertaining to try and unlock them all. The levels will have a set number of waves of aliens that will come through trying to capture power cores and return them to their ship. If you lose all your power cores the game is over. The graphics in Defense Grid are amazing. All the levels are excellently done and well detailed. You have the option of zooming in so close that you can see the detail of each alien. The excellent detail adds to the game since you feel like you are there when you zoom in. When an alien captures a power core, cheering on your turrets won't be unusual. The sound is another bonus to this game. An excellent selection of music and sound effects add to the realism. The one minor drawback that stands out, is the lack of difficulty settings. It would increase the playability if it were possible to make the game harder. Starting out easier and increasing difficulty is an okay way of making a game, but if you could make it even harder there would be more incentive to replay the game. The challenges add some amount of difficulty to each level when you go back to complete them. Defense Grid: The Awakening is by far one of the best tower defense games available. With 20 levels and challenges to complete you will be entertained for hours. A tutorial and simple controls let almost anyone play this game. A lack of difficulty settings is more than offset by the number of challenges you will face. If you start playing this game you can be assured that you will soon be hooked.